Hello everyone and happy Monday to you! Wow...where did the weekend go? They sure do get away quickly don't they? I took a bit of time this weekend to play with my newest stamps from Peachy Keen. I have used sentiment stamps for a very long time, but I'm still pretty new to coloring stamped images. I'm afraid that I may have a new crafting "addiction" with Peachy Keen stamps! Their stamps are just so stinkin' cute and can be used in so many ways. I would love to take a class on using Copic Markers, but haven't been able to find one in my area. So, I'm thinking about taking an online course. Any suggestions? If you have taken an online course I would love to hear your thoughts! Notice the nasty little stains on her sweet dress! I just love the shocked look on her face - it reminds me of my boys as they listened to me rant and rave about running late and having to change clothes...again! My "boys" are now 29 and 31 years old and guess what....it really did all come out in the wash! Guess I could have saved some of that ranting and raving! Thanks for taking a walk with me down memory lane today! And now, ironically, I need to go work on my laundry. Thanks for stopping by and I hope you have a wonderful Monday! I think you did an Awesome job with the coloring Tanya. Such a cute card, I only have peachy keen face stamps, but i think I will need to expand my collection. This is absolutely adorable! 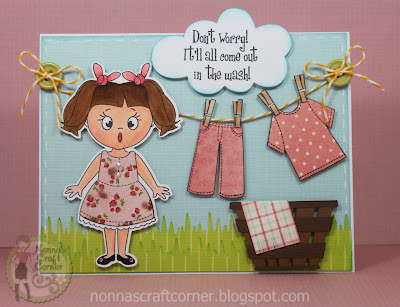 LOVE the clothesline, so very cute! now they're 19 and almost 18...yikes! OMG...this card is too cute! Your card is really fun! Love her surprised look! How adorable. Love her facial expression. Oh, Tanya, this is just soooooooo adorable. Your coloring is really coming along. Her expression is priceless - great stamp. Love the paper piecing as well. This is so super duper adorable!!!! Love the sentiment and love the papers! Oh my gosh, what a absolutely adorable card! I just think it is PERFECT and a VERY true sentiment! 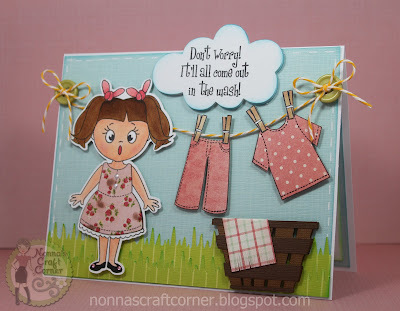 Super cute, Thank you so much for posting your card at Peachy Keen this week. LOVE that senitment Tanya, this is absolutely adorable!!! Wow Tanya! This is absolutely wonderful!!! This is just too cute, Tanya. I know exactly what you are talking about, I have 4 sons and 4 grandsons. This is fabulous!! I love it all. I totally get it as our 2 are 14 months apart. 31 and 32 now but we are watching her go through the same stuff with our grandson. I'd like to take the next class but will have to wait. Thanks for sharing your creation with us at PKS! Tanya, this is so cute! You did a great job on the coloring!! TFS! Oh I cant tell you how much I love this!!! That scene is adorable and I love that you did the inside of your card too!!! Thank you so much for playing along with us this week at Peachy Keen Stamps. Hi Tanya Lynnette here, I also have three boys oldest is 28 and youngest is 23 and i used to rant and rave about clean clothes also and hang them up on the line in town. Now on a acreage where I could I don't have a clothesline and sometimes i wish i would have one. But now my clothes get dirty because it is berry picking and pie making season here. Just wanted to share and thanks for the look back. I loved it and i love your card. WOW!! Gorgeous!! LOVE it!! So adorable!! Thanks For Playing with us @ PKS!! OMgosh! This is so stinkin cute! I love it! Thanks for joining the Peachy Keen Challenge!